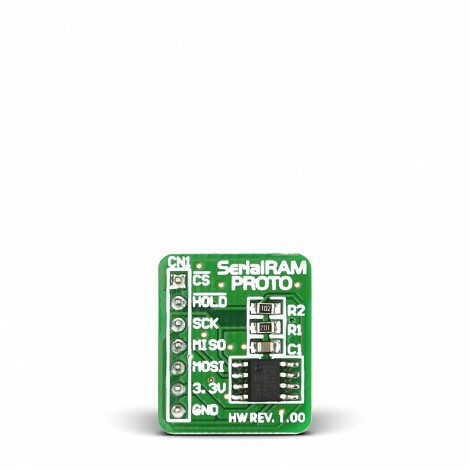 The SerialRAM PROTO Board enables you to add a Serial RAM device to your prototype device. A 23K640 Serial RAM device is available on-board and communicates with microcontrollers via a Serial Peripheral Interface (SPI). The SerialRAM PROTO Board features an 8192-byte Serial SRAM 23K640 designed to communicate via the microcontroller's SPI interface. It is a great choice for depositing large ammounts of temporary variables and acquisition data, and using them in your code. Perfectly fits into all standard prototyping breadboards.